In my last post, you got to see what I wanted, now I'm here to show you what all the beauty/makeup/skincare loving people in your life want. 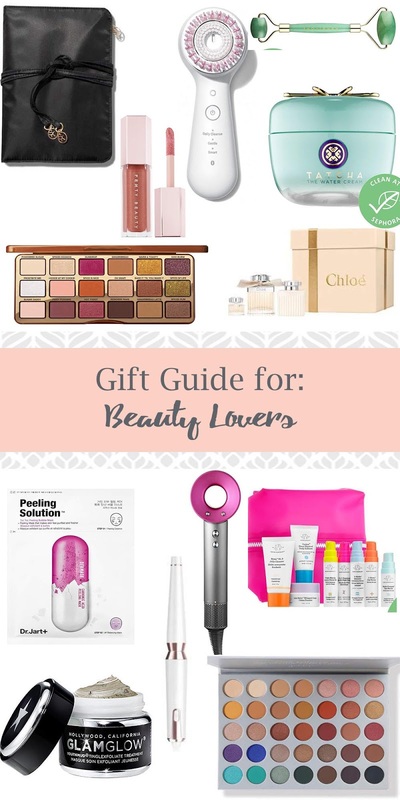 I would proclaim myself a bit of a beauty aficionado myself and every item on this list is totally something they'll love if they don't already! This is perfect for any girl who loves to travel, or is tight on space for storing their collection. Bonus: It comes with a brush roll for easy packing. Jade rollers are great for reducing inflammation and just overall relaxation. Stick it in the fridge, throw on some moisturizer or and oil and get rolling. Too Faced is notorious for their amazing scented products and this one does not disappoint. The gingerbread scent will leave them remembering the holiday (and the awesome person who gifted it) every time they pick it up. Another skin care line every has been gushing over is Drunk Elephant. This set can let the recipient of your awesome gift try out a little bit of all the favorites. Great picks! I'm going to Asia soon so I might look into picking up a jade roller there--I've been curious about it! Oooh that's so exciting! I hope you have tons of fun there. I bet they'll have a ton of great options!